The research and development of the prototype of China's new-generation exascale supercomputer Tianhe-3 is complete, the National Supercomputer Center in Tianjin announced Thursday. The final version of Tianhe-3 will be operational by 2020, and will be 200 times faster and have 100 times more storage capacity than the Tianhe-1 supercomputer, China's first petaflop supercomputer launched in 2010, according to Liu Guangming, head of the National Supercomputer Center in Tianjin. "The new-generation exascale supercomputer is expected to become irreplaceable technology dealing with challenging problems in the fields of economy and science in China," Liu said. 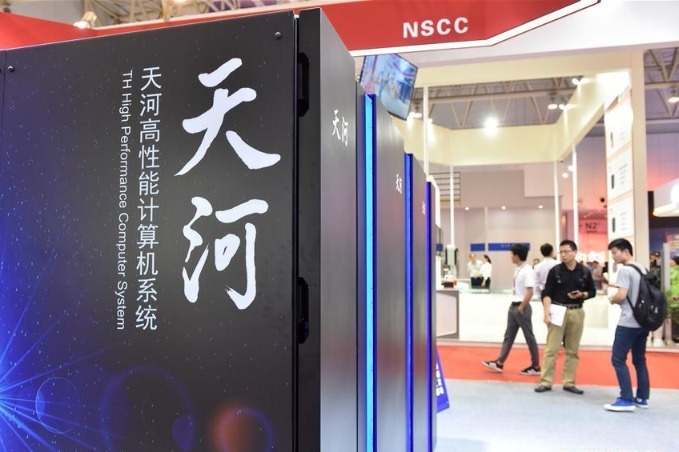 "A high-performance computer service platform integrating supercomputing, cloud computing, big data and artificial intelligence will be built on the basis of the Tianhe-3 supercomputer," said Meng Xiangfei, head of the center's applied research and development department. A sample machine for China's new-generation exascale supercomputer is set for launch this year. The new supercomputer will be 200 times faster and have 100 times more storage capacity than the Tianhe-1 supercomputer, China's first petaflop supercomputer launched in 2010.